You can find the full results and analysis from last year’s race here. The Course Rating for IM Australia is 07:03. IM Australia has 1m+1f Pro Kona slot(s). It has a total prize purse of 40.000 US$, paying 6 deep. The strength of the field is 24% of a typical Kona field. IM Boulder has 1m+1f +2u Pro Kona slots. It has a total prize purse of 40.000 US$, paying 6 deep. IM Cairns has 2m+2f +2u Pro Kona slots. It has a total prize purse of 150.000 US$, paying 10 deep. Here’s a look at how the Kona 2019 Pro field is shaping up. 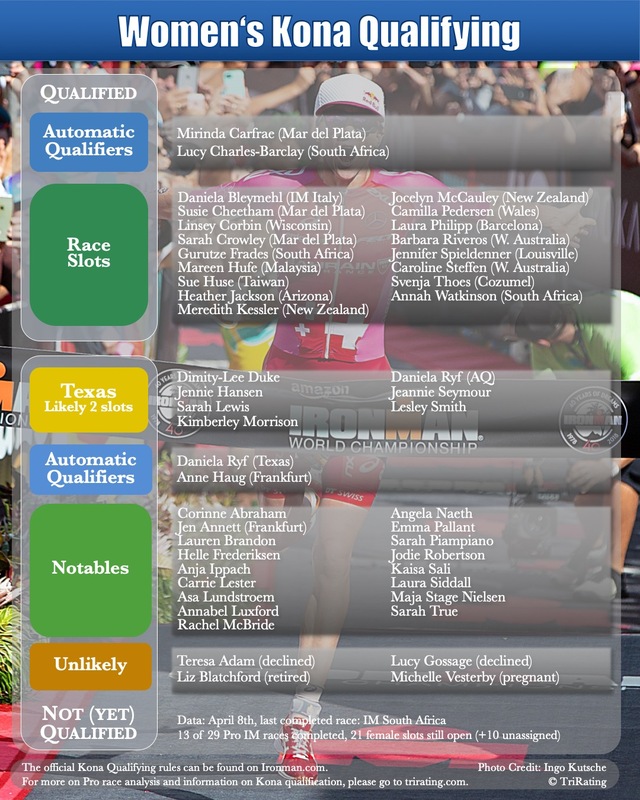 With the changed Pro Qualifying system a number of athletes have already secured their place on the Kona start line, and a few more with Automatic Qualifier slots still need to validate with an Ironman finish but can also be reasonably certain to race in Kona this October. All the rest have to finish at the front of one of the remaining qualifying races. 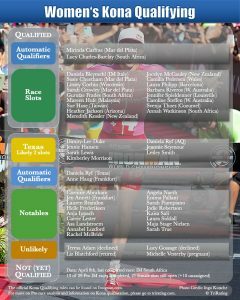 Athletes with Automatic Qualifier slots (previous Kona winners, last year’s 70.3 winner, last year’s Kona podium finishers) that have already validated their slot with a finish in an Ironman. Athletes that have received a slot by winning a Pro Ironman race or finishing near the top. Athletes with an “AQ” that still have to validate by finishing an Ironman. 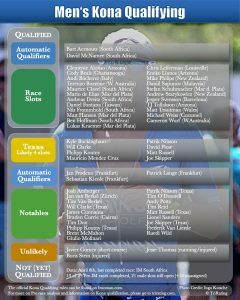 Some other high profile athletes that have not yet secured their Kona slots. 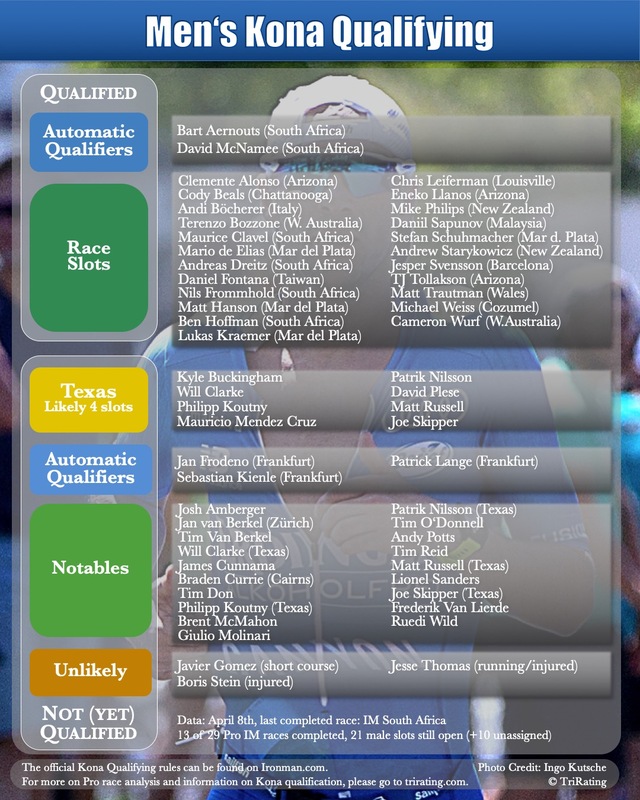 I have added some of their race plans (as far as they are known) – please let me know if some plans are incomplete or when someone is missing. Athletes that are unlikely to go for a Kona slot.